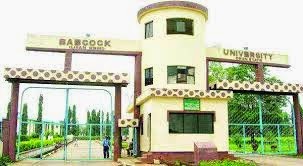 Sources disclose that Babcock University has allegedly announced a new sanction for students who engage in PDA (Public Display of Affection) often referred to as “Dorcassing” by the students, in the university premises. 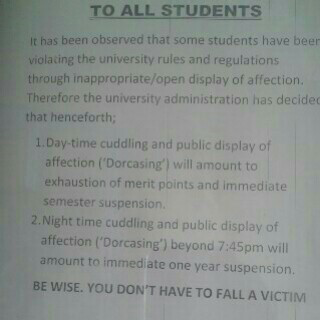 The new memorandum which was obtained on BlackBerry Messeger via a student of the university says any student who engages in cuddling and public display of affection – during the day – will have his or her merit points deducted and immediate suspension from the school for a semester. Night time however will see the student being suspended immediately – for an academic year. Do you think this is extreme or harsh for University students who happen to be youths and not children?